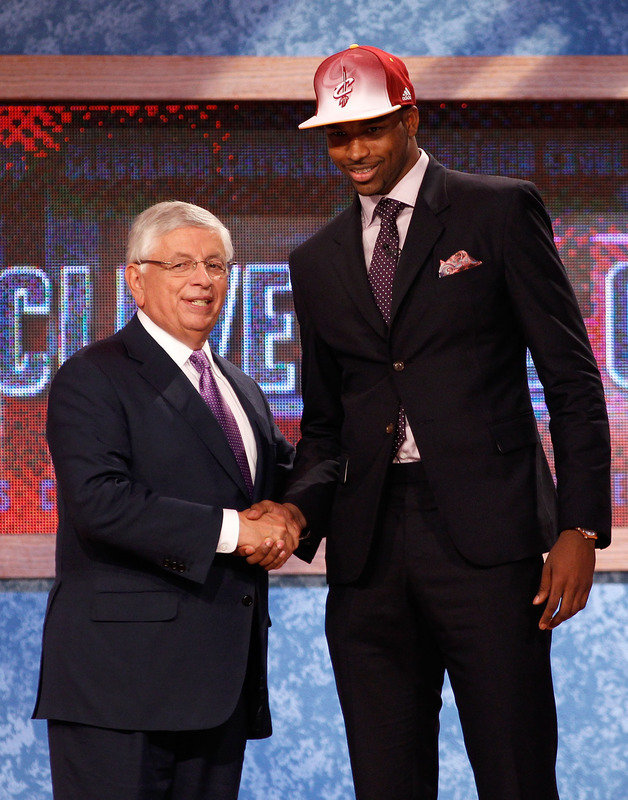 The 2011 installment of the NBA Draft was not given the opportunity to be great. Madison Square Garden, the usual host for festivities, is under renovation so the hopeful rookies had to travel across the Hudson River to Newark and walk the stage at Prudential Center. Bloggers and basketball pundits dismissed the next class of NBA talent as bottom tier. Also, with a lockout looming - will these young men ever see playing time? In 2003, LeBron James' oversized white ensemble was better suited for a pimp and not the first overall draft pick. His personal style has evolved thanks in part to the dress code, maturity and careful image management. The NBA instituted the dress code in 2005 and it came at the perfect time as menswear was moving towards to the skinny suit and tailored styles thanks to Hedi Slimane at Dior Homme. Fitted or "European" styles began dominating locker rooms along with luxury sneakers and Louis Vuitton everything. Braids began disappearing as Carmelo Anthony shaved his off and Kobe Bryant switched from jerseys pre-game to suits. Players no longer wanted to look like Allen Iverson but now Kanye West's fashion forward style evolution was to be mimicked. This year's draft class may not have hit the perfect style notes but it's clear that with the help of stylists, the new kids are learning how important fit is in a suit. Gone are the days of the LeBron white suit or Jalen Rose's infamous red atrocity. Without further ado, here's the best, worst and downright average style grades for the 2011 NBA draft class. It should come as no surprise that a New York kid wins my award for best dressed. Kemba Walker won my respect and fashion gold star last night because he wore a suit that was not only perfectly cut for his body type but because he was able to still let his personal style shine through. Last year, Wesley Johnson's plaid pants and double-breasted ensemble may have been sartorially inclined but it looked like the outfit wore him, not the other way around. Walker looked both comfortable and cool in the single breasted blue-grey suit. The peaked lapels were in proportion with his shoulders and the jacket was modern without being fussy. Walker was already on my radar for his understated, well-fitting suit at Connecticut's visit with President Obama after winning the NCAA National Championship. His big heart and great speaking skills makes him a complete player off the court as well - he's a marketing dream. In fact, he already has endorsement deals in place with Axe and Best Buy without the elusive title of being the number one draft pick. Walker's accessory choices elevated his look from above average to exquisite. 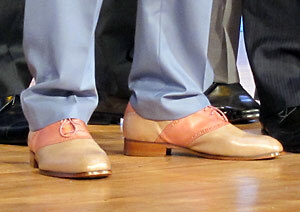 The pocket square in beige with a pink hue picked up the rose gold outsole of his two-tone shoes. The tie bar kept his look clean but added some visual interest on his thin, patterned tie. Even his belt was a leather with a pink undertone to tie it all together. Fellas, when I say the items of your outfit don't have to match but they have to go, I'm talking about putting an ensemble together like Walker's. The hues (underlying color) are all in the same family - blue in the primary items and pink in the accessories. Since the colors are all related, they work in harmony. I'm excited to see what Walker brings to Charlotte off the court. According to my favorite Bobcats' source, Ben Swanson (a.k.a. CardboardGerald), the rookie came to the press conference dressed to impress in Louis Vuitton sneakers. Kemba Walker, you're on my fashion radar. He's my early pick for style rookie for the season....if we get a season. Walker's swag dominated the night but credit has to be given both to my Canadian countryman Tristan Thompson, as well as Marshon Brooks for sporting full ensembles not just a suit. 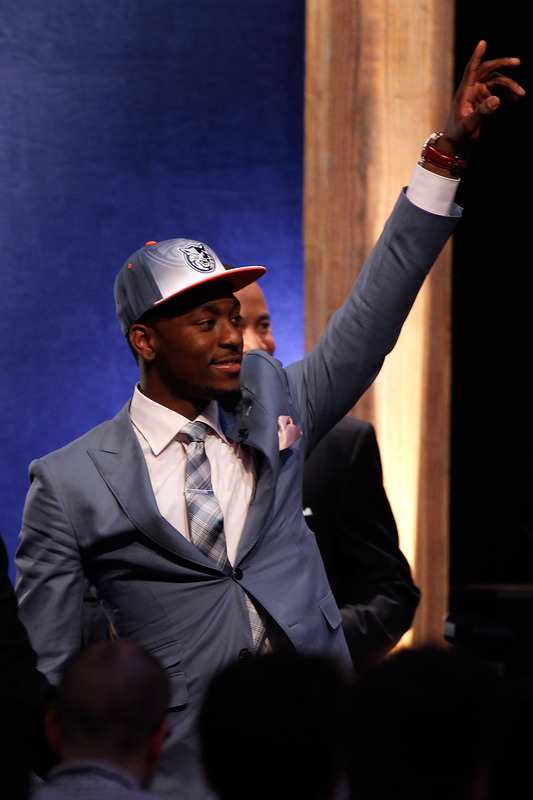 Thompson (and his personal shopper) found a suit that managed to fit him perfectly without looking snug in the shoulders or short in the sleeves - an issue for a player with a seven feet, two-inch wingspan.The polka dot tie contrasts with the pink tone in the shirt and the paisley pocket square ties it all together.His rose gold watch face is the right shade for his skin tone and the leather watch strap and shoes are the perfect complimentary shade of warm saddle brown - this is how to wear black and brown together. It certainly looked like Thompson dressed to best match his new Cavaliers cap - think he knew something the media didn't? 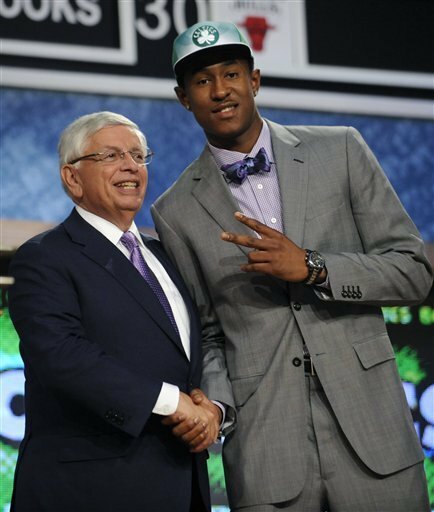 In every draft class, there seems to be one player that calls dibs on the bow tie and tries to make it work for him. 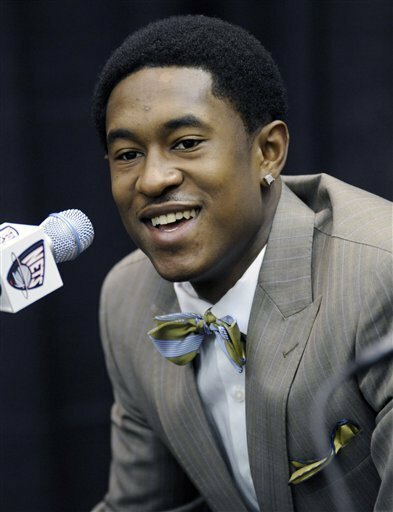 This year, Marshon Brooks took the honor. The last time a bow tie was worn properly was when James Harden sported his cream ensemble and has since had the neck accessory a signature. Brooks seems to be following Harden's sartorial example. Brooks was originally drafted by the Celtics before being moved to the Nets, sported another bow tie at his introductory press conference in Newark. For draft night, his two piece grey suit fit in the shoulders and the sleeve length was fine although it could be taken in more in the torso and in arm width to remove some of the bulk - the ill fit was made obvious when he stood up to meet Commissioner Stern. Besides the technical suiting issues, the patterned shirt mixed with the neutral grey suit really make the bow tie the star to the outfit. A good tactic to draw attention up to Brooks' face and away from the terrible adidas draft caps. The number one pick in the 2011 NBA Draft was Kyrie Irving out of Duke University and the only thing that streamed first overall about his outfit was his timepiece.Besides the impressive watch, the rest of ensemble was average - decent fitting jacket and shirt, pants could be tailored and the tie was too skinny and poorly knotted. Hopefully fellow rookie Tristan Thompson and veteran NBA fashion plate Baron Davis can help their new teammate take some risks this season. 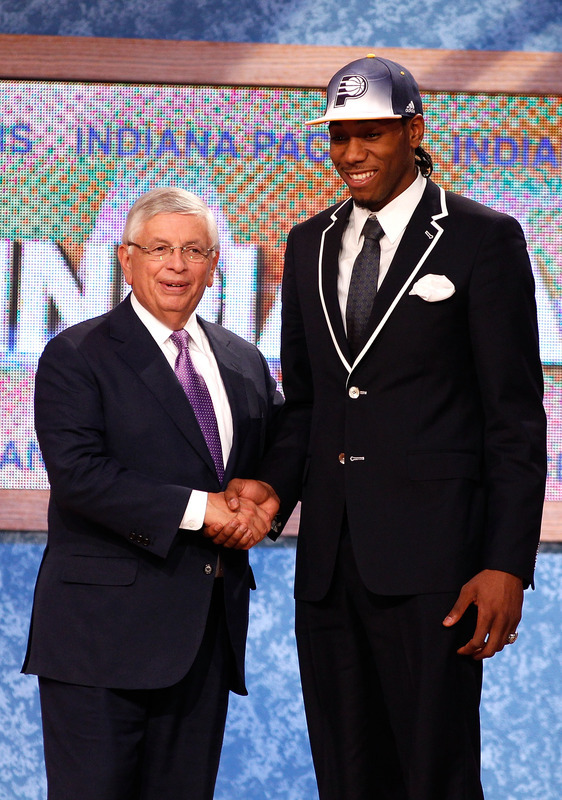 Speaking of sartorial risks, Kawhi Leonard went for preppy throwback look with white piping on black two button suit. When I originally saw this suit, I immediately thought he belonged on a yacht or perhaps parking cars at the yacht club. The buttons are a bit distracting and the pocket square seems like an afterthought but the piping has grown on me. Keeping the shirt and tie relatively neutral was a smart move so it didn't distract from the jacket. The fit is decent, but as with many of these young men, the sleeve could be slimmed down. A pop of color or sheen in the pocket square could have upgraded the look and he might want to re-think the braids - no one should take manscaping cues from Udonis Haslem. Pocket squares have become the new accessory of choice for NBA draftees in recent years and this year, some players either didn't put enough thought into them (Leonard) or tried too damn hard. It's important to remember that for these young men, most of their interviews will head and shoulder shots so the pocket square will be shown and having one that looks like a used tissue stuffed in your pocket looks sloppy. The Morris brothers were a great story of the draft, twins going one right after another to different cities for the first time in their young lives. But they had me crying foul all over Twitter as with the pocket square, bigger is not necessarily better as you have a limited space to display your accessory. Markieff Morris, the slightly older twin and the first to be drafted, thirteenth overall to the Suns, wore a pinstripe suite that looked be right off the rack and ill-fitting on his massive frame. The jacket is too long, the shoulder are bunching and sleeves and pants must be taken in. Also, on a large man a three-piece suit adds bulk, he should have gone for a sleeker silhouette. As for the pocket square, it looks like he found some iridescent Kleenex and stuffed it in his pocket. The fact that you actually see a bulge from the access fabric in the jacket is a terrible look. Remember, it's a square, not a scarf. While we're on accessories, white watches, like white sunglasses, often just look cheap and it does not work with his outfit at all. 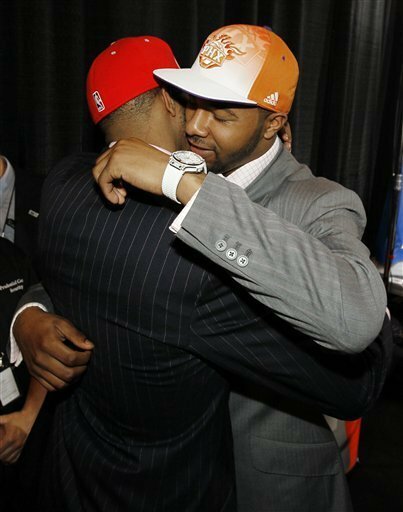 Marcus Morris, the younger brother by seven minutes, was drafted next to another Western Conference team, the Houston Rockets. Marcus, followed suit almost literally with a pinstripe three-piece suit in black that was looked to fit in the shoulders but not so well elsewhere. Not to be outdone by his brother, upped the pocket square ante as his almost reached his tie knot - far too large. I'm all for flair but the pocket square took over his entire outfit and you became distracted by his accessory and not listen to what the newly minted rookie had to say. Also, if you look the Morris' brothers wore similar shirt and ties. The best moment from the twin's draft came from their interview with their mother, who was also in a pinstripe suit, who said she wouldn't wear either of the adidas draft caps - smart woman. As for the rest of the draft class, it was nice to see the players put some effort into their attire, the recent explosion of athlete stylists are certainly helping keep the players current. Derrick Williams tried to work with a skinny suit silhouette but didn't make it. The tailoring was fine but the tie knot didn't work with the shirt or the tie width. The bright red tie was a nice burst of color, but some more texture would have really made Williams stand out. Jimmer Fredette came into the draft with plenty of hype thanks to his ridiculous NCAA campaign. While Fredette's stock dropped a touch on concerns over lack of defensive fundamentals and size, his fashion game could probably use a return to basics. His jacket hit in the wrong spot and Fredette looked like he was sporting a pot belly. The stance on his jacket was a touch high and the cut made him look boxier. Dressing in BYU blue (navy suit, blue tie, blue shirt, blue watch) was a nice nod to his alumna matter but it came off a little dull. Fredette is more modest than most NBA rookies but his giant timepiece and rapping brother give the impression that the young man from upstate New York wants to take a few more risks. Finally, I have to give points to Jonas Valanciunas, my hometown Toronto Raptors fifth overall draft pick. Most Raptors picks were hoping that local hero Tristan Thompson would have his homecoming on the Air Canada Centre court, but as usual the Raptors went European. Valanciunas went for subtle but well-tailored. The olive-green tie and pattern mixing with a different pocket square elevated the look from basic to interesting. The sleeve length was also on point so kudos to the unknown centre. I'm sure he'll be a frequent visitor to Yorkville this season, Toronto's high-end shopping neighbourhood soon. Overall, this year's draft class was an improvement over last year's. The new crop of NBA rookies need to continue to practice and perfect the art of fit and how to dress their frames. Hopefully they'll start taking more risks and find their own personal style among the NBA trends and Louis Vuitton littered locker rooms. Good luck gentlemen and welcome to the big leagues. Photos courtesy of ESPN.com,Yahoo Sports and NBA.com.